The Colombia via Boston DJ and producer's renditions of “Goin’ To See My Baby" and "Backstrokin'" mark the launch of his label, Bacalao. For the past decade, Medellin, Colombia-based DJ and producer Benjamin Woods has excelled making reverent disco-funk jams inspired by Afrobeat and Latin grooves. While he got his start flipping samples and helming dance parties in his native Boston as a member of Whiskey Barons, his solo work as Bosq is more expansive and danceable, relying on live-instrumentation and a revolving door of collaborators from around the world. His 2018 LP Love & Resistance is a perfect encapsulation of his genre-and-border defying approach, enlisting artists like soul veteran and Curtis Mayfield collaborator Nicole Willis and Beninese singer and former Fela Kuti affiliate Kaleta, along with many others throughout the album. But since the release of Love & Resistance, Bosq’s upcoming releases have been in limbo since his previous label Fania was bought out last summer. Because of this, he's decided to launch his own label Bacalao with a pair of excellent and endlessly funky covers of the Fatback Band, the iconic New York City soul-funk band that has been extensively sampled by everyone from A Tribe Called Quest to Kendrick Lamar and Bjork. He reunites with Kaleta on both his renditions the band’s 1973 single “Goin’ To See My Baby” as well as their 1980 ripper “Backstrokin’” and the results couldn’t be more infectious. Recorded between Bogotá, Colombia and New York City, Bosq recruited La Bogotá Orquesta Afrobeat to provide horn arrangements over his skeletal synth and percussion. He explains to Noisey over the phone, “The horn line in "Goin' to See My Baby" is based around the scatting that the Fatback Band had done in the original track. Those vocals really stuck out me because it was clear he was trying to replicate a James Brown trumpet riff with his voice.” In New York, Kaleta, who also performs in Super Yamba, provided vocals on both covers, reinterpreting the lyrics in English, French, and Yoruba. 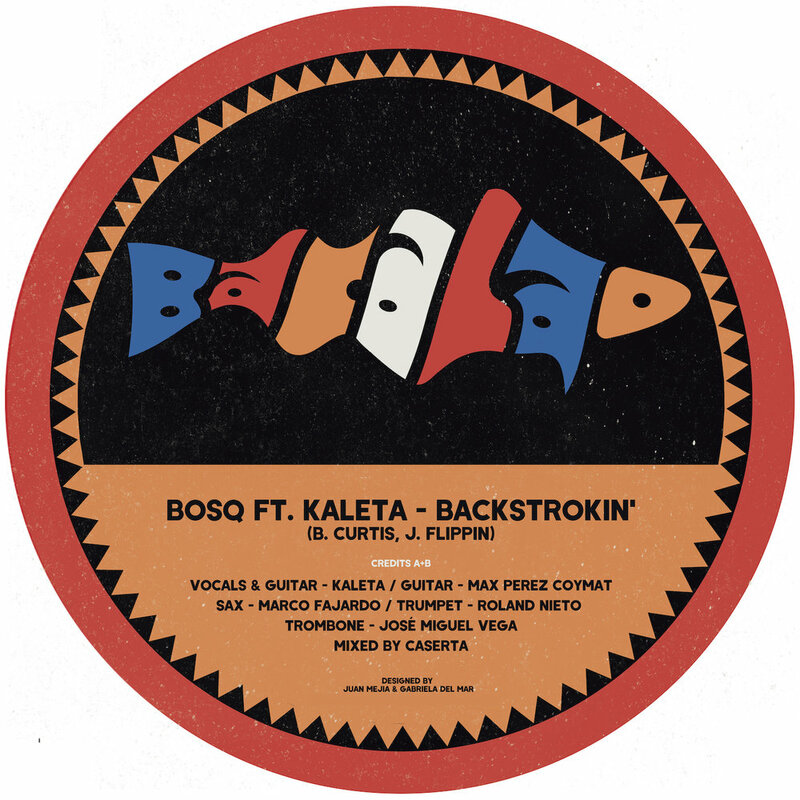 For Bosq, who plans to self-release more music on his label in the coming months, says reuniiting with a music veteran like Kaleta was a no-brainer. “It's really important also to not just be the white dude making afrobeat-influenced music without sharing any of the possible benefits I'm going to get with the originators,” he says. “I think everyone who does music like that owes it to the people who came before.” You can pre-order the 12-inch here and track Bosq as he announces tour dates throughout Europe and the U.S. this summer. Listen below. New Album "Love & Resistance" out now! 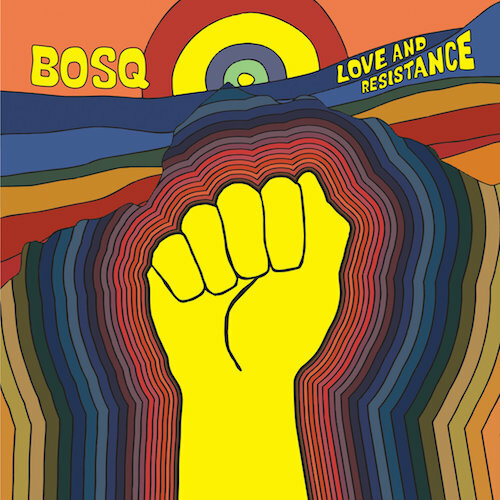 Bosq’s aptly titled third full-length effort “Love & Resistance” is a collection of songs that reflect a producer’s continuing emergence by diving deeper into his influences. The strains of Afro and Latin flavors are interwoven and still heavily permeate but the underlying groove and rhythms have taken on a more modern, jazz-funk and disco-soul vibe with nods to Bobby Caldwell, Roy Ayers, the Mizell brothers and Nile Rodgers’ Chic. Originally based out of Boston, MA but now calling Medellin, Colombia home, Bosq's new surroundings have inspired him to create his most diverse and creative album to date. Already featuring the top tune “Can’t Seem To Hide” with Megan Doherty that made a splash off the gates as the first single from the album (10/10 rating from Mixmag), the whole album is soldered together with each track being a single-worthy release in it’s own right. Featuring guest vocalists on all but one of the tunes including frequent collaborators Kaleta, and Nicole Willis, along with Ray Lugo who’s known for his work in Kokolo and Boogaloo Destroyers. LA based singer Induce and new duo Lucid Paradise (E da Boss & Ishtar) along with vocalist Bruno Morais whose classic Brazilian voice is reminiscent of Jorge Ben round out the cast of Bosq’s most vocally varied album work to date, reflecting both his growth as an artist and his willingness to push his own sonic boundaries. A relentless work ethic fused with a broad and varied music palette all attuned to the groove and a focus on making folks move has led to numerous remix projects, most recently with legendary Benin-based Orchestre Poly-Rythmo De Cotonou. With a steadily growing fan base and reputation amongst fellow artists and musicians, Bosq’s immediate future is already laden with releases lined up for Fania and his collaborative effort Body Music alongside The Rapture’s Vito Roccoforte. I was lucky enough to be asked to remix the legendary Son Palenques track "La Negra" and the results are now out! Cop it on Bandcamp or listen on Spotify! It was an incredible honor for me to be asked to do a group of official remixes for the Legendary Orchestre Poly Rythmo. I tried to add to the tracks without ruining what originally made them so special by adding lots of extra live percussion, (subtle) drum machines and dancefloor friendly arrangements! You can preview them all on soundcloud and buy the vinyl at fine retailers like Juno. Digital is now available on Bandcamp, Traxsource, and from many other fine digital music vendors. You can stream it on Spotify as well. A new vibey midtempo tropical disco remix for my friend Jeffrey Paradise of Poolside! You can see the video here, which intersperses clips from my day to day life in Colombia with vintage found footage. The soundcloud link has 1000 free downloads. My new disco project infused with jazz, funk, gospel and house influences was just released this past week on Razor-n-Tape records out of Brooklyn, NY. Body Music is myself along with Vito Roccoforte, drummer / co-founder of The Rapture and 1/2 of Vito&Druzzi. If you want more info on how we linked up head to our facebook page, or just check out the lead video titled "Just One". Bosq Y La Candela All-Stars Out Now! At a hotel just outside of San Juan Puerto Rico, a chance meeting in the winter of 2015 between Bosq and the legendary Tempo Alomar (Apollo Sound, Orchestra Rytmo Africa Cubana), resulted in an off the cuff next day collaboration on Soul Clap Records titled “Tumbalá”. When local label head / bar owner Pablo Rodriguez (Candela Records, La factoria, Don Pablo, La Cubanita) heard the results he quickly invited Bosq back to record more extensively with some of the many local musicians he knew and had longstanding friendships with. This included many of the legends from classic Salsa Records (Horn Players & Vocalists from Roberto Roenas Apollo Sound - as well as the man himself) local Plena legends like Tito Matos and Luis Lagarto Figueroa, as well as the up and coming next generation such as Luis De La Rosa Solá of Orquesta Macabeo. With a few weeks to prepare Bosq sketched out skeletons and progressions for the songs from his studio in Jamaica Plain, MA and then headed down to Old San Juan with the hopes of recording the entire album in just 10 days. Upon arrival, the reality of the situation (including the lack of a studio) quickly set in. The first few days disappeared into the construction of a makeshift work space and walled off corner to record in. The next few days were eaten just as quickly trying to track down musicians. Finally on the 6th day Tempo Alomar and his infectious positive energy arrived with a storm of Timbales, Congas, and words setting the tone for the remaining days in which Bosq camped out in the middle of Old San Juan and greeted a cast of visiting musicians that included even a surprise visit from Tomasa Rivera, the sister of the islands most beloved singer, the late Ismael Rivera. The results of that whirlwind are now presented to you as San Jose Cincuenta y Uno - an exploration of the various intersections of Puerto Rican music with African styles, Reggae, Classic Funk, House music and much more. The concept was to highlight the influence Puerto Rico has had on music around world, as well as the influence the rest of the world has had on Puerto Rico. From the very African Plenas to the crossover Latin Funk in 70’s New York to the musical dialogue between dancehall & reggaeton and how that intersects with salsa. Nothing on this record is traditional per se but it is all very much filled with and inspired by the Puerto Rican spirit. Bosq "Tumbalá EP" now available on vinyl! The sun drenched funky afro latin disco EP "Tumbalá" on Soul Clap Records is out now on vinyl! Pressed on absolutely beautiful marble green vinyl & accompanied by hard hitting remixes by Auntie Flo (Tumbalá) and Caserta (Because you) on yellow vinyl. Cop them both at any of the fine retailers below! Cumbia En Bahia video premier & giveaway! Wax Poetics premiers my first ever official video today, for "Cumbia en Bahia" off of my brand new Celestial Strut LP. The video is a slightly psychedelic journey through the beautiful mountains of Colombia that I captured mostly from bus, jeep & car windows between La Eje Cafetera & Medellin. I became obsessed with the smooth panning visuals & the simplicity of pressing a phone to the window and hitting record during my first trip to South America a few years back when visiting the homeland of my wonderful girlfriend in Chile. Since then it's become somewhat of a habit and the expansive bus systems in most of South America make it the perfect place for it. We handed over the footage to friend GM from Ce Con De Chat for final editing and here we are! Certainly not a narrative but more of a tribute to my favorite country in the world and a visual companion to a track that fully owes it's lineage to Colombia! Also to grab a free download of the track, check out my interview over at DripFM ! It's been a long time coming for my second full length on Ubiquity Records but hopefully y'all have been held over with the EP's, remixes & mixtapes. This record, like the first, is journey through a lot of the different styles of music I love. It ranges from Cumbia, Salsa & Afrobeat to Disco, Soul & House, and in most cases there's a little bit of it all. 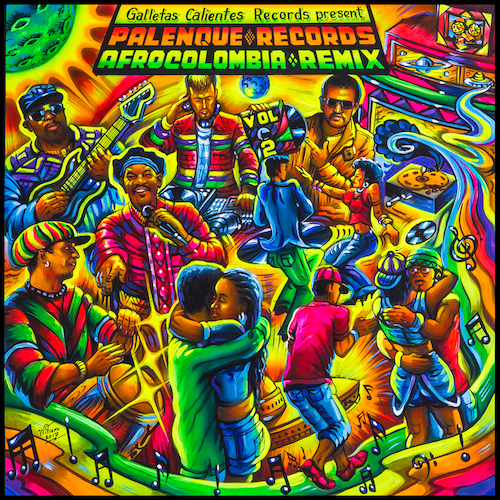 I'm extremely honored to work with the collaborators I was able to on this record - Jimmy Riley from legendary rocksteady group the Uniques, Kaleta from the Egypt 80, Nicole Willis, Angeline Morrison, Jesus Pagan y Conjunto Barrio, Evan Laflamme, Kuyen from Chile, Jacobo Velez from Colombia, Steve Haney of Jungle Fire and local homies like Yuki Kanesaka, Mark Usher, Serge Gamesbourg and Caserta. Did I forget anyone?! I hope y'all enjoy the record! My new EP on Soul Clap Records is available now exclusively on Beatport with full release in 2 weeks. I'll update purchasing options here as they pop up! The EP is a mix of Afro / Latin / Disco / Funk & House influences and features some mighty collaborations. Vocalists Tempo Alomar & Danielle Moore (from crazy p) lend there beautiful voices to tracks, horn genius Evan Laflamme handles all of the sax work on Tumbalá and Serge Gamesbourg kills the live bass on "Because you". The whole thing is mixed and mastered by Caserta and the artwork by Medellin's Lucas Piedrahita. Prince Klassen over at the legendary Turntable Lab had me over for a quick live mix of entirely original material last time I was in NYC. Afterwards he asked me some questions about coming up, going from edits to OG's, studio set ups, boston & more. Check out the mix and give the interview a look and enjoy!